"Polar molecule" and "Nonpolar" redirect here. For other uses of the term "Polar", see Polar. A water molecule, a commonly used example of polarity. Two charges are present with a negative charge in the middle (red shade), and a positive charge at the ends (blue shade). In chemistry, polarity is a separation of electric charge leading to a molecule or its chemical groups having an electric dipole moment, with a negatively charged end and a positively charged end. Polar molecules must contain polar bonds due to a difference in electronegativity between the bonded atoms. A polar molecule with two or more polar bonds must have a geometry which is asymmetric in at least one direction, so that the bond dipoles do not cancel each other. Polar molecules interact through dipole–dipole intermolecular forces and hydrogen bonds. Polarity underlies a number of physical properties including surface tension, solubility, and melting and boiling points. In a molecule of hydrogen fluoride (HF), the more electronegative atom (fluorine) is shown in yellow. 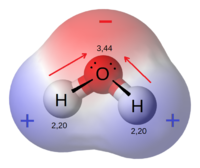 Because the electrons spend more time by the fluorine atom in the H−F bond, the red represents partially negatively charged regions, while blue represents partially positively charged regions. Not all atoms attract electrons with the same force. The amount of "pull" an atom exerts on its electrons is called its electronegativity. Atoms with high electronegativities – such as fluorine, oxygen, and nitrogen – exert a greater pull on electrons than atoms with lower electronegativities such as alkali metals and alkaline earth metals. In a bond, this leads to unequal sharing of electrons between the atoms, as electrons will be drawn closer to the atom with the higher electronegativity. Because electrons have a negative charge, the unequal sharing of electrons within a bond leads to the formation of an electric dipole: a separation of positive and negative electric charge. Because the amount of charge separated in such dipoles is usually smaller than a fundamental charge, they are called partial charges, denoted as δ+ (delta plus) and δ− (delta minus). These symbols were introduced by Sir Christopher Ingold and Dr. Edith Hilda (Usherwood) Ingold in 1926. The bond dipole moment is calculated by multiplying the amount of charge separated and the distance between the charges. These dipoles within molecules can interact with dipoles in other molecules, creating dipole-dipole intermolecular forces. Bonds can fall between one of two extremes – being completely nonpolar or completely polar. A completely nonpolar bond occurs when the electronegativities are identical and therefore possess a difference of zero. 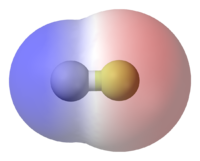 A completely polar bond is more correctly called an ionic bond, and occurs when the difference between electronegativities is large enough that one atom actually takes an electron from the other. The terms "polar" and "nonpolar" are usually applied to covalent bonds, that is, bonds where the polarity is not complete. To determine the polarity of a covalent bond using numerical means, the difference between the electronegativity of the atoms is used. Pauling based this classification scheme on the partial ionic character of a bond, which is an approximate function of the difference in electronegativity between the two bonded atoms. He estimated that a difference of 1.7 corresponds to 50% ionic character, so that a greater difference corresponds to a bond which is predominantly ionic. As a quantum-mechanical description, Pauling proposed that the wave function for a polar molecule AB is a linear combination of wave functions for covalent and ionic molecules: ψ = aψ(A:B) + bψ(A+B−). The amount of covalent and ionic character depends on the values of the squared coefficients a2 and b2. While the molecules can be described as "polar covalent", "nonpolar covalent", or "ionic", this is often a relative term, with one molecule simply being more polar or more nonpolar than another. However, the following properties are typical of such molecules. A molecule is composed of one or more chemical bonds between molecular orbitals of different atoms. A molecule may be polar either as a result of polar bonds due to differences in electronegativity as described above, or as a result of an asymmetric arrangement of nonpolar covalent bonds and non-bonding pairs of electrons known as a full molecular orbital. The water molecule is made up of oxygen and hydrogen, with respective electronegativities of 3.44 and 2.20. The electronegativity difference polarizes each H–O bond, shifting its electrons towards the oxygen (illustrated by red arrows). These effects add as vectors to make the overall molecule polar. A polar molecule has a net dipole as a result of the opposing charges (i.e. having partial positive and partial negative charges) from polar bonds arranged asymmetrically. Water (H2O) is an example of a polar molecule since it has a slight positive charge on one side and a slight negative charge on the other. The dipoles do not cancel out resulting in a net dipole. Due to the polar nature of the water molecule itself, polar molecules are generally able to dissolve in water. Other examples include sugars (like sucrose), which have many polar oxygen–hydrogen (−OH) groups and are overall highly polar. If the bond dipole moments of the molecule do not cancel, the molecule is polar. For example, the water molecule (H2O) contains two polar O−H bonds in a bent (nonlinear) geometry. The bond dipole moments do not cancel, so that the molecule forms a molecular dipole with its negative pole at the oxygen and its positive pole midway between the two hydrogen atoms. In the figure each bond joins the central O atom with a negative charge (red) to an H atom with a positive charge (blue). The ammonia molecule, NH3, is polar as a result of its molecular geometry. The red represents partially negatively charged regions. The hydrogen fluoride, HF, molecule is polar by virtue of polar covalent bonds – in the covalent bond electrons are displaced toward the more electronegative fluorine atom. Ammonia, NH3, molecule the three N−H bonds have only a slight polarity (toward the more electronegative nitrogen atom). The molecule has two lone electrons in an orbital, that points towards the fourth apex of the approximate tetrahedron, (VSEPR). This orbital is not participating in covalent bonding; it is electron-rich, which results in a powerful dipole across the whole ammonia molecule. 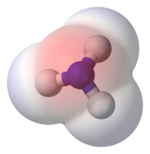 In ozone (O3) molecules, the two O−O bonds are nonpolar (there is no electronegativity difference between atoms of the same element). However, the distribution of other electrons is uneven – since the central atom has to share electrons with two other atoms, but each of the outer atoms has to share electrons with only one other atom, the central atom is more deprived of electrons than the others (the central atom has a formal charge of +1, while the outer atoms each have a formal charge of −​1⁄2). Since the molecule has a bent geometry, the result is a dipole across the whole ozone molecule. When comparing a polar and nonpolar molecule with similar molar masses, the polar molecule in general has a higher boiling point, because the dipole–dipole interaction between polar molecules results in stronger intermolecular attractions. One common form of polar interaction is the hydrogen bond, which is also known as the H-bond. For example, water forms H-bonds and has a molar mass M = 18 and a boiling point of +100 °C, compared to nonpolar methane with M = 16 and a boiling point of –161 °C. A molecule may be nonpolar either when there is an equal sharing of electrons between the two atoms of a diatomic molecule or because of the symmetrical arrangement of polar bonds in a more complex molecule. For example, boron trifluoride (BF3) has a trigonal planar arrangement of three polar bonds at 120°. This results in no overall dipole in the molecule. In a molecule of boron trifluoride, the trigonal planar arrangement of three polar bonds results in no overall dipole. 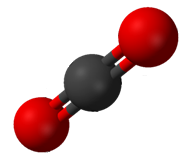 Carbon dioxide has two polar C-O bonds in a linear geometry. Not every molecule with polar bonds is a polar molecule. Carbon dioxide (CO2) has two polar C=O bonds, but the geometry of CO2 is linear so that the two bond dipole moments cancel and there is no net molecular dipole moment; the molecule is nonpolar. 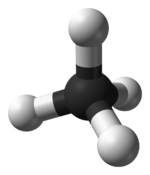 In methane, the bonds are arranged symmetrically (in a tetrahedral arrangement) so there is no overall dipole. Examples of household nonpolar compounds include fats, oil, and petrol/gasoline. Therefore, most nonpolar molecules are water-insoluble (hydrophobic) at room temperature. Many nonpolar organic solvents, such as turpentine, are able to dissolve non-polar substances. In the methane molecule (CH4) the four C−H bonds are arranged tetrahedrally around the carbon atom. Each bond has polarity (though not very strong). However, the bonds are arranged symmetrically so there is no overall dipole in the molecule. The diatomic oxygen molecule (O2) does not have polarity in the covalent bond because of equal electronegativity, hence there is no polarity in the molecule. Large molecules that have one end with polar groups attached and another end with nonpolar groups are described as amphiphiles or amphiphilic molecules. They are good surfactants and can aid in the formation of stable emulsions, or blends, of water and fats. Surfactants reduce the interfacial tension between oil and water by adsorbing at the liquid–liquid interface. A micelle – the lipophilic ends of the surfactant molecules dissolve in the oil, while the hydrophilic charged ends remain outside in the water phase, shielding the rest of the hydrophobic micelle. In this way, the small oil droplet becomes water-soluble. Determining the point group is a useful way to predict polarity of a molecule. In general, a molecule will not possess dipole moment, if the individual bond dipole moments of the molecule cancel each other out. This is because dipole moments are euclidean vector quantities with magnitude and direction, and a two equal vectors who oppose each other will cancel out. Any molecule with a centre of inversion ("i") or a horizontal mirror plane ("σh") will not possess dipole moments. Likewise, a molecule with more than one Cn axis will not possess dipole moment because dipole moments cannot lie in more than one dimension. As a consequence of that constraint, all molecules with D symmetry (Schönflies notation) will, therefore, not have dipole moment because, by definition, D point groups have two or multiple Cn axis. Since C1, Cs,C∞h Cn and Cnv point groups do not have a centre of inversion, horizontal mirror planes or multiple Cn axis, molecules in one of those point groups will have dipole moment. Contrary to popular misconception, the electrical deflection of a stream of water from a charged object is not based on polarity. The deflection occurs because of electrically charged droplets in the stream, which the charged object induces. A stream of water can also be deflected in a uniform electrical field, which cannot exert force on polar molecules. Additionally, after a stream of water is grounded, it can no longer be deflected. Weak deflection is even possible for nonpolar liquids. ^ Jensen, William B. (2009). "The Origin of the "Delta" Symbol for Fractional Charges". J. Chem. Educ. 86: 545. Bibcode:2009JChEd..86..545J. doi:10.1021/ed086p545. ^ Ingold, C. K.; Ingold, E. H. (1926). "The Nature of the Alternating Effect in Carbon Chains. Part V. A Discussion of Aromatic Substitution with Special Reference to Respective Roles of Polar and Nonpolar Dissociation; and a Further Study of the Relative Directive Efficiencies of Oxygen and Nitrogen". J. Chem. Soc. : 1310–1328. doi:10.1039/jr9262901310. ^ Pauling, L. (1960). The Nature of the Chemical Bond (3rd ed.). Oxford University Press. pp. 98–100. ISBN 0801403332. ^ Pauling, L. (1960). The Nature of the Chemical Bond (3rd ed.). Oxford University Press. p. 66. ISBN 0801403332. ^ Ziaei-Moayyed, Maryam; Goodman, Edward; Williams, Peter (2000-11-01). "Electrical Deflection of Polar Liquid Streams: A Misunderstood Demonstration". Journal of Chemical Education. 77 (11): 1520. Bibcode:2000JChEd..77.1520Z. doi:10.1021/ed077p1520. ISSN 0021-9584.